The view from the ranch in Taos. 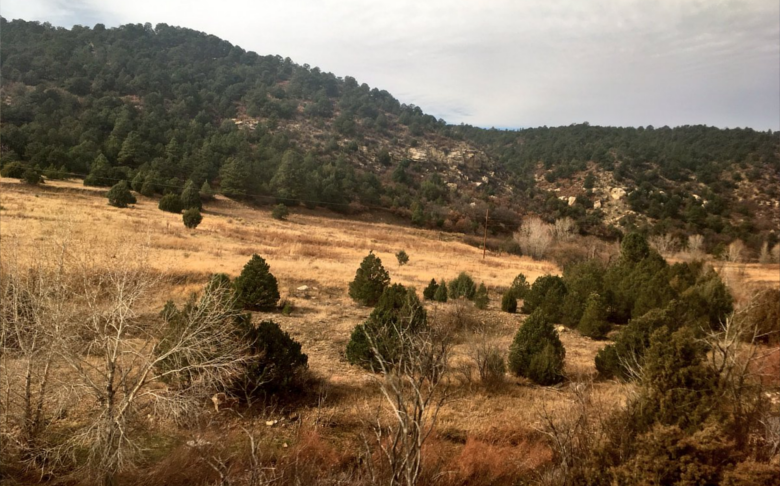 The next morning, I got the bus to Santa Fe – a rickety, no suspension ride through the bumpy roads of mountainous New Mexico. As we rode along, trying not to throw my coffee all over myself, I marvelled at the landscape of this incredible state. As we traversed through a canyon, in one of the rare moments I had any signal at all, I checked Google Maps for where we were to discover that the river we were driving beside was the Rio Grande, snaking its way through the rocks. This was probably the most special of the accidental iconic things I’ve done on the trip. Meow Wolf's amazing walk-in fridge. Santa Fe was somewhere I’d had on my list of places to visit for a while, since becoming interested in the later work of Georgia O’Keeffe when assisting on the development of a play about her. The O’Keeffe museum was my first stop where I arrived, after a breakfast of Heuvos Rancheros, of course. The collection of the museum is quite small with much of O’Keeffe’s most famous work elsewhere and often in private collections, but it was a good overview of the style of an artist who has come to define this part of the county with her landscapes and skulls – I’ve never been much of a fan of the flowers of her earlier New York work, though this was the first time I’ve seen some of her urban landscapes which I enjoyed. I wandered through town toward the old religious centre of Santa Fe – the plaza with its basilica, the Loretto chapel and the mission. The basilica reminded me of the Pugin cathedral we have at home in Nottingham with the Romanesque Revival interior, although with a distinct Latin feel as well. The Loretto was striking too with its incredible free-standing wooden spiral staircase, whilst the mission is the oldest church still standing in the United States. This was quite a corner for US heritage. After this I went for the entirely different, Meow Wolf, an art installation and experiential story-telling puzzle world in a converted bowling alley. From the seemingly ordinary confines of a suburban house I had to investigate the death of a young boy who may have been transported to another dimension. The set up was very cool – especially the part where I got to walk inside a fridge to another world beyond! At my lodgings in Santa Fe, where I stayed with a British author and sculptor, Christopher, I met yet another Brit – who I never actually got introduced to and it got to the point where it was too rude to ask his name!! He offered me a lift back to Albuquerque and we talked in his hire care about his work as a school teacher in Acton. When I got to my motel – it had gotten to the stage in the trip where it definitely had to be laundry day as I was running out of pants. The next day, I met Pat and Marianne from Albuquerque Reads outside Bel-Air Elementary on the north side of the city, not far from my motel and the Walmart I keep on doing all my shopping in. AR is a slightly different organisation to many that I’ve worked with on the trip as their funding model and organisation structure is rooted in the city’s Chamber of Commerce and is staffed, financed and administrated through this collective of local businesses. The session I would be working on is one of the long-standing Kindergarten reading programs and, as ever, I offered to jump in the deep end and read with some of the children. First up with the lively Tiago who once we settled down to reading took in loads and could tell me, in great detail, what had happened in the Little Red Hen book we were reading. Aaliyah, my second student, was less fidgety but enjoyed the reading less too. She came to life however when we got on to the letters and colouring exercise – a creative writer for the future, no doubt! My day with AR was my last in New Mexico, a State which had a real impact on me. I’m not sure whether knowing the Lawrence connection and reading up on his experiences here had influenced this, especially reading extracts from Mornings in Mexico when I was I Taos. I’ve waffled a lot about NM and really hope I’ll be back, but it was time for me to head to Phoenix for a brief visit and to meet Read On Arizona. Mine and Terri's speccy selfie at Read On Arizona. Phoenix was sketchy. The motel I was staying in was rough, smelt funny and had everything – light switches, plugs etc. – in odd places. Sirens where an almost constant. But it was cheap and the best burrito I’d had up to that point was from the 24 Taco Stand less than 5-minutes’ walk away - a walk I only did in day light. I met Read On at their funky offices across town. Terri, RO’s Executive Director, talked me through their work and the large-scale partnership of organisations that they try to coordinate and resource with best practice. Through this work, over the last 4 years there has been a 4% increase in children reading at grade level by 3rd grade in the areas whether the program is running, although this has been a 1% rise in year 3 and a 3% rise in year 4, highlighting the importance of this being a long-term project, not a one-year flash in the pan. Terri also had a background in the film industry and had met her now husband on Robin Hood: Prince of Thieves! This was a very special handing over of a Robin Hood hat! The resource pack Terri shared with me I think will be able to support my work immeasurably when I get back and she’s offered to link me up with the academics she’s had check the workings and develop the model too. From the meeting with Terri I headed into Phoenix to check out their arts district – the aptly named Roosevelt Row and had a wander around in the heat of the desert city. With the area around my iffy motel not especially well lit, I didn’t stay out long and headed back, via the taco truck. I was only in Phoenix for a day and the next morning it was back to the Greyhound Station (I have my final Greyhound tonight and that is a welcome statement!) to head to San Diego. I was hit with one of Greyhound’s ‘amazing’ quirks of the fact it only guarantees to get you to your destination, not on a set bus, and I was told that the bus I booked, via Yuma and Calexico, was full and I’d have to go via LA – meaning I wouldn’t get to the Mexican border and adding 4 hours to my trip! I wasn’t best pleased. I arrived in San Diego late and jumped straight in an Uber to meet my host, Haroun, who had been a scholar back in 1977 and now lived in San Diego. He’d generously offered to put me up for my time in SD. I’ll get onto Haroun much more in my next post, which will focus on my time with him and up in Modesto for Thanksgiving, but after a quick supper, I headed to bed as I was working in the morning. The next day, Haroun (my ever-giving host) gave me a lift to National City where I’d be meeting Travelling Stories for their story tent session! In a gazebo in the San Diego sun, there was an oasis of books and volunteer reading tutors. The premise for Travelling Stories’ program is that children will either read books with the volunteers or telling the volunteers about the books they have read this week as a mini-report and receive, in return for their reading, “book bucks”. They could then exchange their book bucks for small gifts at the Travelling Stories commissary (a large crate full of cool gifts). I read with two children – Nourah, who didn’t like reading very much, or so she told me, and Anthony. Nourah, after some coaxing, read a book of nursery rhymes with me – although some I think she knew already and could sing them rather than read them properly. I then read her a book about a monkey that didn’t want to go to bed! Anthony was keener and picked out lots of non-fiction on history and biology, but needed quite a bit of help on his ambitious choices. Anthony even drew a picture of me and him reading a book on sharks in the tent, although heartbreakingly he wanted to take it home with him, so I had to make do with a photo. I didn’t have much else booked in for San Diego literacy-wise except for a quick visit to their public library’s children’s area, which had a Godzilla exhibition and I read the chapter on FDR and Eleanor in their copy of the Champions of the Four Freedoms there. From SD I knew there would be some downtime – heading into Thanksgiving week – and then a more frantic final week in LA and San Francisco, where I’d be meeting with my final organisations including two 826 chapters and the national office too (I’m currently in the midst of this!) so, when I have a morsel of time, I’ll catch you all up on this too. Thanks for reading! "Smile, yer mardy bogger!" - me and Bert at the D H Lawrence Ranch. So reader, I made it – my view currently from Woody’s Breakfast and Burgers in Pacific Beach, San Diego is of the small boardwalk, sand and the mighty Pacific Ocean rolling in in front of me. I don’t think I’ve ever been anywhere else which is as beautiful as an urban environment – this is no great National Park, it’s no Cliffs of Moher, but it is an incredible neighbourhood of surf shops, fish taco stalls and, most importantly independent coffee shops with WiFi and a view of the ocean! However, to catch you up I must venture back 1370 miles East, to 1800 Barnes Bridge Road, East Dallas, TX – where I last left you, at the start of my marathon to Taos, New Mexico on my “savage pilgrimage” to the American home of D H Lawrence, Eastwood’s purveyor of muckeh storehs and one of the counties greatest literary sons. 1800 Branes Bridge was where I was working with Miss Grace at the Arberg Centre and their Pre-K language sessions on a Thursday. My next stop, Albuquerque, was where I would like up with my contact Eva was my destination and Eva and I would meet at 9:30 on Saturday. Between then I was travelling, pretty much flat out! I first needed to catch a bus to the main transit interchange by Dealey Plaza in Downtown. Whilst waiting for this bus I met Steve – who to my great surprise had spent a year as a student living in Newark! He’d been through Nottingham but never really explored the city, however he had an intimate knowledge of Newark and the Morrisons! One thing I never thought would happen when sat on a bus in greater Dallas was discussing going to Newark Morrisons! Steve was great company and we had a lively conversation about US and UK healthcare and medicine, which was joined in with by two Hispanic ladies on their way to their lunch club. Experiences like this further convince me that public transport is THE ONLY WAY to see this amazing country and speak with people you’d never meet flying or driving! Ratton and the New Mexico Countryside. The bus dropped me back at Dealey Plaza allowing for a second look around at the grass knoll and I grabbed some new toothpaste from 7-11 (useful extra insight there, reader!). I then caught the local commuter train service from Dallas across the metroplex to Fort Worth. This again was another cool ride through the different areas of West Dallas, where I had been with Readers 2 Leaders, and into the other cities of this great metropolis – Arlington, Fort Worth and others. Fort Worth was where I’d get my first Amtrak up to Oklahoma City. This set off at dusk and I saw the sun setting over the East Texas cattle ranches and oil fields – another experience of the crazy rip that I’ll not soon forget. We arrived in OKC late and it was a mad dash for my connecting bus, which would take us from Oklahoma to Newton, Kansas – I say “us” there was me and one other guy who couldn’t drive as he had his license taken by Oklahoma State Police for driving marijuana over state lines from Colorado, where it is legal. A dark, middle of the night drive via Wichita, where I had a quick YouTube listen to Glen Campbell, I got Newton – where the weather was -2 Celsius! Here I’d wait for my next Amtrak, “The Southwest Chief”, all the way to Albuquerque. Pretty much from boarding I slept through the prairies of Kansas and woke up to the sun peeking through my little train window curtain and I was in southern Colorado. It was a misty morning in the Centennial State and this hung low over the ground new fully burning off as the train processed through the landscape toward the border town of Trinidad. From Trinidad the train would continue through the Ratton Pass (pronounced Rah-tone, not rat-on, which made many people give me funny looks). Emerging from the steep walled pass into New Mexico, the weather was changes and so to the scenery. The misty Colorado hills were replaced by yellow desert sands, ochre bluffs and pine green tufty shrubs under a burning sun. New Mexico had arrived. We traversed down through the old mining towns of Ratton, Las Vegas (New Mexico, not Nevada) and Lamy on an Amtrak that was forever stopping for little to no reason for 20-30 minutes at a time in a small siding. It appears that great swaths of the American Amtrak runs on a single track through some of these states, especially New Mexico, so any delay is compounded by the need to allow other trains going the other way to pass you as well if you’re of schedule even by a minute! I arrived into Albuquerque 2 hours late and got an Uber directly to the motel I was staying in before meeting Eva – I was knackered and crashed out pretty much as soon as I arrived. The next morning, fuelled on motel coffee I met Eva. Eva works for the University of New Mexico, and administrates (amongst other things) the writers initiatives at the D H Lawrence Ranch. Taos, where the ranch is located is about 2 hours north of Albuquerque and when driving up through the passes and canyons of this incredible state, I was stuck, like Lawrence himself was, by the beauty of such a unique landscape. This was the setting of every Morricone, every Peckinpah Western I’d ever seen and I wanted a Fist Full of it. The mountain town of Taos, nestled under its namesake mountain, was another of those little gems which I feel should be added to the itinerary of every scholar! Especially with the literary Nottingham connection. As we drove up into the mountain’s foothills and the pine forest that grows up in these higher climes, a sign told us we were only a few miles from the ranch, driving along D H Lawrence Road. As we pulled through the swing gate, the house shared by Freida and her third husband, Angelo Ravagli, after Bert’s death. Just a short walk round behind this newer house was the cottage in which Bert and Freida had lived in their years in Taos. On the porch sat a chair which Lawrence is reported to have made and painted, its position looking out into the meadow where I imagine the Lawrence’s beloved cow Susan would have grazed and nearby the shade offered by the “Lawrence Tree”, a tall majestic pine which featured in Lawrence work and in the paintings of Georgia O’Keeffe who was a later guest at the ranch. In the small, cold cottage the two rooms of a living space with a range and cosy twin bedroom gave some idea of what the quarters of the Lawrences would have been like and on the information signs there was a fun anecdote of Bert climbing, shirtless with a wet cloth covering his mouth and nose, onto the roof to clear a rats nest. Walking back to Freida and Ravagli’s house and heading up the hill in the opposite direction to the cottage is another winding concrete path leading, zig-zaggingly up toward a small chapel-like building, white against the green pines, with a phoenix resplendent atop it. Its large wooden doors, imposing against the white walls heavily creak open to a small chamber. To the left a bureau, a book and framed documents in French – the articles of D H Lawrence’s disinterment from his original burial in Vence, France. 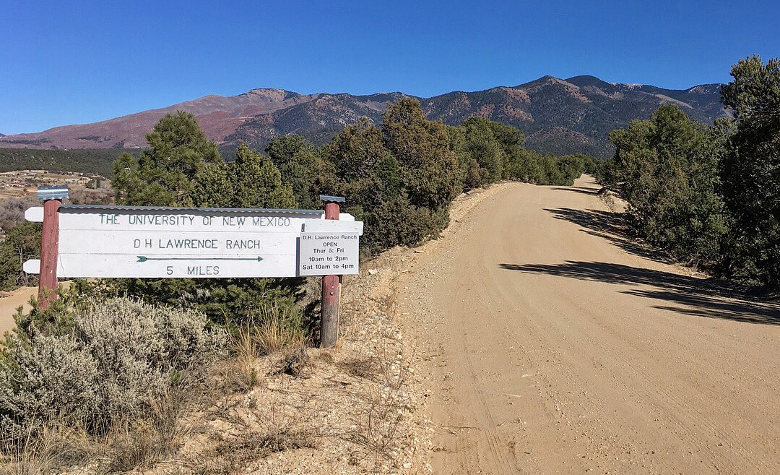 Lawrence it is variously claimed to have his final resting place here in Taos, after Ravagli was sent to France to bring Bert back to New Mexico so lie here, where Freida now lived. Many theories abound as whether this is really where Lawrence is buried, whether his remains went overboard on the journey from Europe, whether Ravagli drunkenly lost them, but the most enduring is that Frieda mixed the ashes with concrete foundations of the monument, to ensure he’d always remain here. 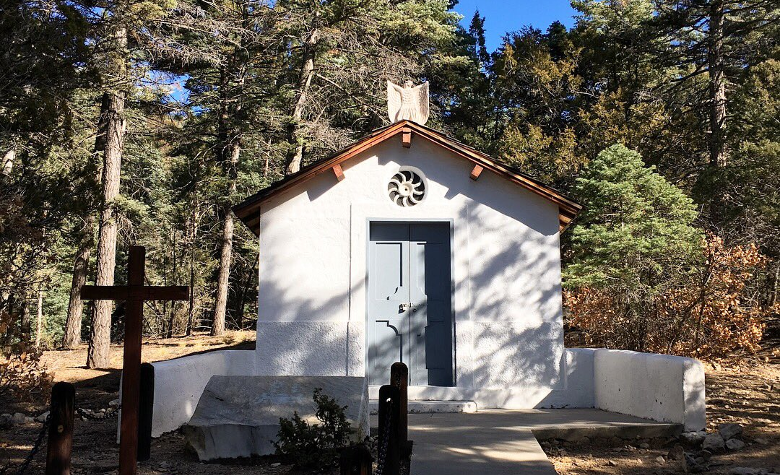 The headstone-like marker inside the chapel building is simple, painted in the yellow hues of New Mexico and adorned with offerings from pilgrims, visitors – a pebble, a pine cone, coffee, chocolate – and hung above is a garland of chillies. It’s a profound and spiritual place. 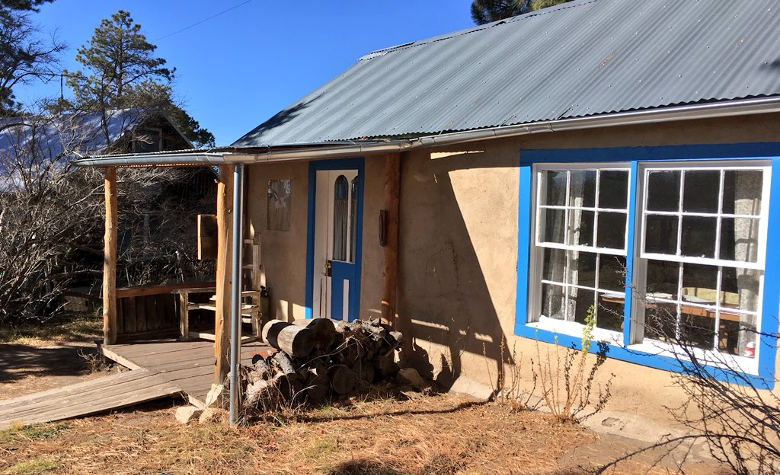 When I open the doors again, and look out, down the avenue of pines to the vista of the mountains across the canyon, it is clear why the Lawrences found this small corner of Northern New Mexico to be their own little slice of paradise. Bert left Taos and his ranch from the last time on his 40th birthday, 11th September 1925. He would never return alive, only making the journey with Ravagli in 1935, 5 years after his death. In my journey across the US, especially as a writer from Nottingham, I found this to be the real spiritual heart of what I’ve done here on my travels. To place my pebble on the headstone, to sit quietly looking out on a view he once knew and to read my battered copy of Mornings in Mexico here was undeniably special. The Benjamin Hooks Library, Memphis. Forgive me, readers, for I have slacked – it has been over a week since my last post, but it’s been some week. By the end of tomorrow I will have travelled, by Google’s estimation although the real number will be higher, 4,443 miles or 40.8 Nottingham to Londons. Also, this number doesn’t include the flight from Manchester, this is all buses, trains, taxis and lifts in the USA. I feel I owe you two blogs and I probably will split my progress up to now into two portions, so first up: Memphis and Dallas – a tale of two cities. Memphis, I arrived into at about 3am where I’d be staying with AirBnB host and Air Force Veteran CC, who very accommodatingly allowed me to arrive at her place at such an ungodly hour of the morning and get some sleep. CC’s was a little way outside of downtown Memphis and as I discovered the public transport around the area were pretty poor on the weekend, so I resolved to have some chill out time, explore the neighbourhood rather than the city and walk the 2 miles or so on Sunday to the Benjamin Hooks Library in Binghampton which is the city’s main hub branch, named after the Civil Rights lawyer from Memphis Benjamin Hooks. Orange Mound, where I was staying, was a very diverse neighbourhood but was close to the university campus (it reminded me of Radford quite a bit) and boasted some great places to eat including Brother Juniper’s where I went for breakfast and the incredible Malia's Wings, where I really didn’t need to go and eat as I’d eaten fairly recently already but I was so glad I did! Malia’s was a trailer and BBQ smoker on a vacant lot by a bus stop with a few overhanging trees that hat been cut into for wood for the fire. The smell, the feel of the place and queue of locals (you knew they were local as they hadn’t driven so must have only lived in a few blocks radius!) marked this out as a must and the rib tips and slaw I had were sublime – some of the best food I’ve had on the trip! I was so full after my day of walking, exploring and eating, that I went back to CC’s and fell asleep! Sunday, as I had mentioned, was my day to walk to the Library and I was impressed. The space was a four-storey glass building was some really cool sculptures outside, which looked like giant rollers, that had impressed into the concrete floor famous quotations, images and depictions of world cultures – including the first verse of Lewis Carroll’s Jaberwocky (a personal favourite). Inside the children’s library was easy to find and had much of the stuff I’d come to expect now from the fantastic library spaces in the US – including tree cloud beds for stuffed animals and another theatre/education space. I had a great wander round but then decided to hole up upstairs, use the wifi and browse their extensive history section. I read a chapter of a biography of Lyndon Johnson ahead of my trip to Texas! The next day was my meeting with Knox, the director of Literacy Mid-South. LMS works across both adult and youth literacy and we had a great chat about the work they do, the data sharing arrangements they have with the city and the school board and the way that they broker partnership working with the voluntary sector, both when this works well and when it doesn’t – especially partners working unilaterally. This was probably one of the less exciting meetings to read about in this sort of a context but it was invaluable to talk with Knox about the issues in Memphis, which felt all too familiar for Nottingham, and the way that they coordinate delivery. Most of the other organisations I’ve met have been much more hands-on, delivery focused and doing that delivery themselves, but LMS in their children’s work are much more a coordinator and it was great to get this perspective. The National Civil Rights Museum at the Lorraine Motel, Memphis. After meeting with Knox and another hat handover, I headed into Downtown Memphis to visit the National Civil Rights Museum at the former Lorraine Motel, the site where in 1968 Dr Martin Luther King Jr was assassinated. The motel has been kept looking as it did in the late 1960s and that I found to be the most moving part of the memorial and the museum. The outside also had very good and informative mini-video screens which gave some context Dr King, why he was in Memphis supporting the striking sanitation workers and the movement he had become the leader of. There was time for a last serving of Memphis style ribs and then I had to get the bus to the Megabus depot for my overnight trip to Dallas. Dallas was again a tale of opposites – opposite sides of the massive metroplex that is the greater Dallas conurbation as I was working in projects on the East and West sides of the city. I arrived, bleary eyed, at around 6am and had to break my rule – I went to Starbucks, as nowhere else was open, it was cold and I was in serious need of a cup of coffee. I had until 3pm to check out downtown Dallas before I could check into my AirBnB so after my coffee and some napping in the corner of the coffee shop, like any enterprising literacy scholar would, I headed to the public library to see what their offer was. Dallas’ J. Erik Jonsson Central Library in Downtown is a very busy space as it acts as an informal day shelter for the city’s huge homeless population. When I was in the main areas the place was packed with people but usefully there seemed to be an accepted rule that these day users wouldn’t go onto the second floor where the children’s library was. It wasn’t as exciting as the other spaces, which admittedly had been recommended to me – it felt a little tired and the staff were understandably wary. There were no children in the place when I was there either, it made it feel very weird when compared to the bustle of the downstairs. After my browse in the library, I had a quick stop off at the grassy knoll and Dealey Plaza where JFK was assassinated in 1963 (this post is becoming a bit of a who’s who of assassinations of the 1960s). Me and Cordaro at Readers 2 Leaders. After talking about the organisational structures with Audrey, I met with Lisa and Cordaro. Lisa was one of the senior tutors and runs the after-school program, which was on whilst I was there, and Cordaro was one of the students. Lisa and I chatted for a while about the history of the organisation and their structure, which was more regimented than some of the others I’d seen but was delivering results. Cordaro and I were then buddied up to do his reading assignment and he read Diary of a Wimpy Kid to me and we learnt the word “founder”. 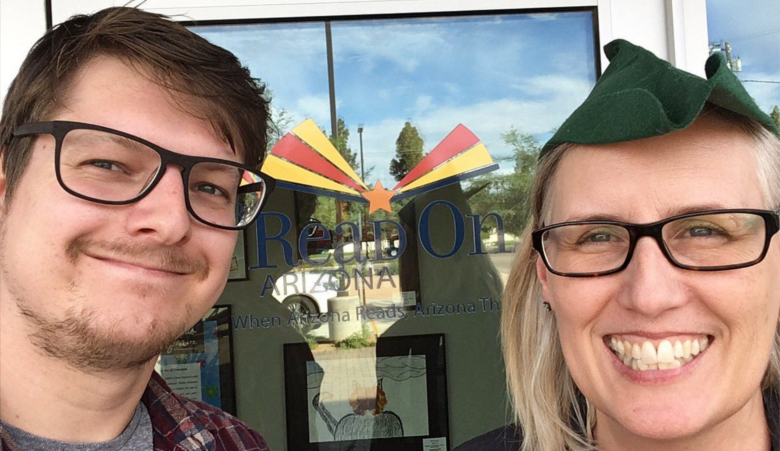 Usefully, Readers 2 Leaders have photo permissions for their young people too, so I was able to get a snap with Codaro and he got to wear the Robin Hood hat! The next day saw me visit the Aberg Centre for Literacy in East Dallas, about an hour from where I was staying. Aberg is a program for the Hispanic community where pre-K children and their parents receive English tuition concurrently in adult and child classes. After meeting Shana, the program’s Executive Director, I was partnered with Miss Grace and her small class of 6-year olds and we spent the morning reading stories, talked about what their plans for thanksgiving might be, dressed up and did jigsaws. We even went to the sports hall and had a kick about. Aberg’s style I liked, especially the importance of play in the way that they worked and involvement of the parents in both the early play sessions, from 9-9:30 the parents are with some of the children before the parents’ English classes start, and the fact the parents get support in their literacy too. From Aberg I then began my longest trek, from East Dallas, Texas to Taos, New Mexico – a bus, tram, train, bus, train, taxi, car journey for 680 miles, including one-night sleeping on the train and one in a motel in Albuquerque, across Texas, Oklahoma, Kansas, Colorado and New Mexico. My “savage pilgrimage” began. Read all about it next time! Howdy, reader! When I last spoke to y’all I was heading through the cornfields of Iowa, when now I’m sat in the foothills of the Great Smoky Mountains in what con only be described as Dixie Vegas or my own new favourite moniker for it, which I came up with yesterday, the “Blackpool” Appalachians – this pun will take some beating on this trip. I’ve been from Iowa to Illinois, Missouri, Kentucky and across the great state of Tennessee. Pigeon Forge, where I am now, is the hometown of the first lady of Country and Western, Dolly Parton, and is home to Dollywood, her theme-park and home, which was the start of the springing up of some of the more eccentric things you’ll find on the main strip here. But, to begin at the beginning and my trip to Alton, Illinois and St Louis. Alton seems a bit of a leftfield choice of a stop, but I was here to meet and stay with my grandfather’s cousin, Tina and her husband David. Tina and I had never met so I was unsure who I was looking for when I got to the parking lot of the Greyhound Station – her Facebook profile picture is of her corgi Dylan. But we found each other fine and 30 minutes later we were in a diner/micro-brewery in Alton having dinner with her friend Marcy. Tina is a real animal lover and has two dogs and “several” cats – Alton has a by-law which limits the number of cats you can have, so I’ll not say exactly how many! I spent one day just chilling in Alton and walked along the river. The next day, I went into St Louis on the train and headed to the neighbourhood of Brentwood to meet the Little Bit Foundation. Me and Ashley at Little Bit in St Louis. It was amazing to see the work which Little Bit does – their model was so a complete, 360-degree, all-encompassing one which, when it saw a need, took steps to combat it. When they identified that many children were not staying at fixed addresses, often moving between parents, aunts, grandparents, then they gave these children large wheel-y backpacks that could fit much more than just their school belongings in. When it was seen that children sometimes came to school with their clothes unwashed, they put washers and driers, plus provided detergent, in schools. They found the Zoe Zookeeper book, a program run by Boots Opticians and The National Literacy Trust, very interesting and, as they are developing STEM programs, I said I’d put them in touch with the wonderful Rick at Ignite! The Literacy programs, when compared to the other organisations I had visited were more modest – book fairs in schools and community settings and a fun pre-K to 2nd Grade program, Books and Buddies, where the class would get a whole class set of books with a paired stuffed animal (a book about a bear with a bear, a dog with a dog) and these would rotate around the class (animal and book) until the whole class had read the lot and then they could chose a favourite book and buddy to take home. After another night in Alton with the amazingly welcoming Tina and David, I headed back to the bus station to go across the country yet again – this time covering 497 miles in a day, with a stop off at a public library! From St Louis I travelled through the countryside to Nashville! And did I go to the Country Music Hall of Fame? No! I went to the library, and I’m so glad I did. Nashville Public Library is currently US Library of the Year and it is a title well deserved. The Reading Fort at Nashville Public Library. The Nashville Public Library’s Children’s Library is one of the most special children’s learning spaces I’ve ever been to – and got the guided tour from Frieda, one of the librarians. The space is huge and is filled with incredible things for children to do beyond just reading the books – however important that is! Like Chicago it has spaces within the bookshelves for the children to crawl through, a climbing wall surrounded by crash mats on one wall and in the centre a “reading fort” which is modelled on the Nashville skyline (I feel a Dylan song coming on…). They also had a large teen section, housed in a part of the library at the opposite end to the children’s library. I liked this separation and the feel in the teen section was very different to the other teen areas which had been contained in children’s/youth section in other places. Here there was games consoles, chill-out spaces and study booths plus an incredible maker space. In the fully staffed space there were three kitted out recording studio booths, a music area, green screen, a video lab, an engineering-design bench and several 3D printers. I met Megan, one of the staff working with the young people there after school that day, and we chatted about the space, how many young people come in and use it and games narrative design – she loved the idea behind Nottingham Libraries and the NVA’s Story Smash! Sadly, I couldn’t stay longer in Nashville as my connecting bus to Knoxville was departing soon, and 3 hours and 1-time zone later. I arrived in East Tennessee. This wasn’t the end of my travel that day, however – a quick Uber-ride from Knoxville and I was in Pigeon Forge in neighbouring Sevier County: the home of Dolly Parton! This is also where my first real mishap of this trip happened as I got drop at what I thought was my motel for this night at about 12:30am, only to find I was at the wrong Rodeway Inn (there were two) and mine was 2 miles further down the road! After a brisk 40-minute walk though I was checked-in and tucked up for some well-earned sleep! The Smoky Mountains in fall (not my picture, but it looked like this). Image courtesy of Visit Gatlinburg. The next day was my meeting with the Dolly Parton Imagination Library – a program which has been running in Nottingham for a while now and we are one of the largest centres for the scheme in the UK. I met with Angie, who is the Library’s International Director, to talk about how the program works and the successes it has had. I also presented her with a lovely hardback edition of the Stories of Robin Hood on behalf of the thousands of children in Nottingham who have received books from the program and a letter from Councillor David Mellen, who has been a tireless supporter of the Imagination Library, thanking them for the difference they are making to children's literacy in the city. This was a slightly different meeting than many of my others as we’re already running the program back home and, in the way that the international model works, the surrounding support is delivered by the local partner, rather than from Dolly’s team here in Tennessee. Small Steps, Big Changes who run Nottingham’s program locally are doing brilliant work and Angie told me of a few other Dolly clusters which are doing interesting and engaging support work with families. One different between the US and UK versions currently is that in every US book, there are specially printed inner flaps on the book dust-jacket with information and reading support tips for parents. This is currently only available on 2 books per age-bracket in the UK as it is too expensive on the scale of the programs, so one way we can help families to gain this extra support is by helping get more children signed up to the library, which you can do here! Sadly, I was unable to meet Dolly herself – she had a big show opening the next day and had a sponsors’ lunch, which was $5k a ticket, that I wasn’t allowed to sneak into, which was fair enough. I did leave with plenty of cool gifts from the library, including the great lady’s autograph! Now I’m heading out West to Memphis – I’ve enjoyed my time in Tennessee, Missouri and Southern Illinois and it has been good to get out of liberal eastern metropolitan university environments. I’ve seen a different America (no better, no worse) and had much more interesting conversations with people, like trying to explain Northern Ireland to a guy on the Greyhound! Trump had to come from somewhere and when you see places that have been left behind and disillusionment has been left to fester, a demagogue can take root. America has problems – but we cannot be naive enough to believe we don’t in the UK. Race has been a very pronounced divide here and that, whilst I knew it was heartbreakingly the case, I still struggle when I go to schools in deprived areas or meet children who are being supported by these projects and the make-up of the groups is strikingly un-diverse and often overwhelmingly African-American. Class and privilege are barriers which we need to destroy back home, but race, here, further compounds it. Please don’t think I feel that we don’t have systemic problems for BAMER communities in the UK – WE DO – but I know in Nottingham, at least, we’re doing better than much of what is provided for diverse and non-white communities are getting here without the interventions of some incredible organisations that I’ve been lucky enough to meet and work with. Sorry for getting political – next stop, Memphis: home of the National Civil Rights Museum. Meeting John Kenyon, Director of Iowa City of Literature. Greetings from Keokuk, Iowa, and my seat on the Burlington Trailways bus to St Louis. 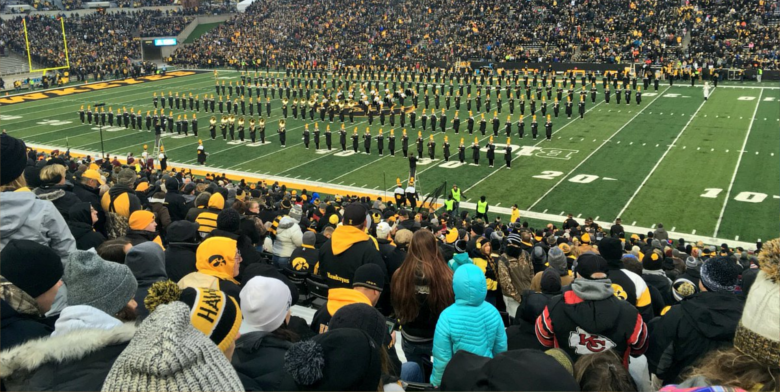 Whilst you may be reading these blogs fairly close together due to me posting them with little time apart, it feels like a lifetime ago that I was leaving Chicago to travel 4 hours west to Iowa City. Iowa City was one of the first UNESCO Cities of Literature and has a good 10 years’ experience under its belt on how to develop and sustain a program of activity, boost awareness and make the having of a CoL office sustainable after the UNESCO start-up funds. This obvious link between Nottingham and Iowa City as sister Cities of Lit and being part of the UNESCO Creative Cities Network had been my initial draw to the place but soon found there’s much more to see and find here with their bustling university seemingly the hub of much of this great activity. With only 2 full days in Iowa City, with one of these being a Saturday, I had to pile much of what I planned to do with organisations into just the one day and, when meeting with both the City of Lit and the IYWP they put me on to other people, who I hope to contact via email and Skype soon. I arrived late-ish on Wednesday and went directly to where I was staying in Coralville, the neighbouring town to Iowa City, but the two have expanded so much that they now feel like one conurbation. And I went to bed, because I was tired out! I would need to be on top form the next day! My first meeting in Iowa City was with Mallory Hellman from the Iowa Youth Writing Project and her team. Mall is a friend of Brandon’s, who I met at 826DC. 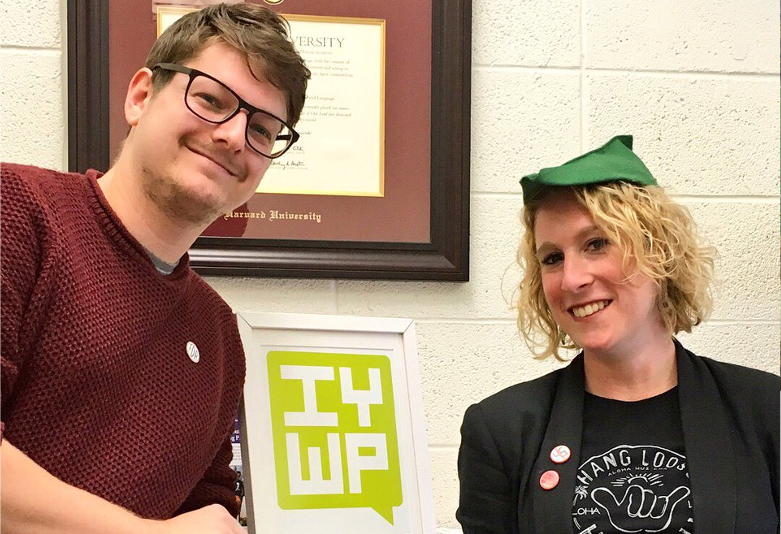 The IYWP deliver in-school workshops and big-out-of-school engagement sessions, like their young writers’ conference which could have over 200 students attending this year! They’re strongly tied to the university and we meeting in Mall’s office on campus. We talk about the model they use, success stories and the commonalities and differences, as we see them, in the US and UK systems – although we veer into talking about healthcare for ages and I do my love-letter/eulogy for the NHS. Later, I have a long conversation about evidencing and impact reporting – the glamorous life I lead! IYWP are going to be in a school later and invite me along so I can see what they do first-hand after my next meeting. Me and Mallory at the IYWP. Next up, is meeting John Kenyon – the director of Iowa City of Literature, at the public library where their office is based. I have a small window of time before meeting John so have a quick wander around town and try to take in some of the brass plaques honouring writers inlaid into the pavements, which form part of the city’s Lit Walks, and have a look at library and its children’s section. I meet John and the Rachels (both of the other two staff members are, not surprisingly, called Rachel) and we talk about what Nottingham is doing as a CoL, Iowa’s specific interests and programming, bookstores and baseball – John is a Dodgers fan and finds it pretty funny that I support the Padres, even having my Padres hoodie on under my jacket. I’m particularly impressed with the work Iowa CoL does with sophomore high-school students with their annual essay writing contest, the Paul Engle High School Essay Contest, where the winning prize of which is a year’s free tuition to the university (!!! ), and the One Book, Two Book children’s literature festival which places work created by children, working with organisations like IYWP, alongside professional, national-profile children’s authors. They have a close association also with an organisation which is the national exam body for one of the tests US children have to complete – they work together in the marking of writing submissions by children and award prizes for both technical proficiency and writing from the heart, something which I really liked as an idea. I also loved the Little Free Libraries and John gave me a plaque for a new library which I hope to set up in Nottingham! John gave me a list of things to do in Iowa City around its literary heritage and contemporary scene and said he’d hook me up with his friend Jim, who runs a tailgate party before the college football games and that there was one on Saturday. My next stop was Mark Twain Elementary school with IYWP where I joined some of Mal’s students for their regular after-school program. I two sessions, one for third-graders and another for fourth-graders, we wrote stories in groups about what Halloween (our prompt was “what would we do if we discovered our house was haunted”) and in the other, wrote definitions for nonsense words and I made the group come up with a definition for “mardy”, which they decided was a type of zebra, or zeeeeeebra, as they would say! On Saturday morning, I visited the front of the Iowa Children’s Museum, who are one of the partners in the One Book, Two Book program that the City of Literature runs. They had some cool STEM activities and ball runs which had attracted a very excited crowd of little Iowans. I got the bus into town and went to visit some of the town’s Little Lending Libraries, which I’d seen online before and then spoken to John about the day before. 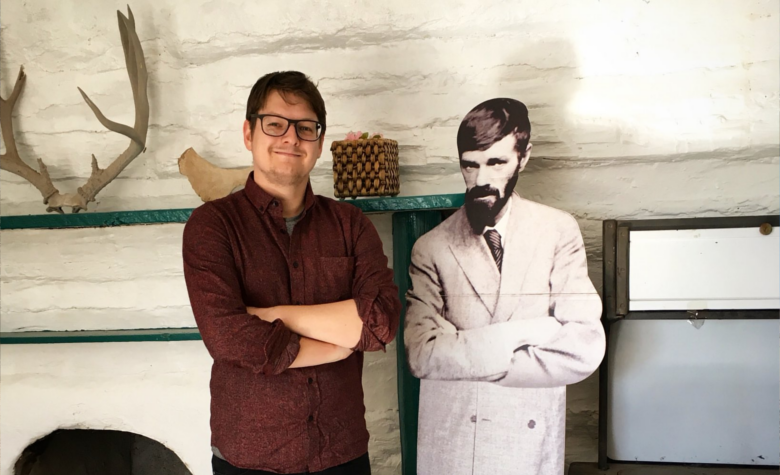 I dropped into the famous Prairie Lights bookstore next and spotted a photo of DH Lawrence up next to the cash register – us Cities of Lit have to stick together! I then took the brisk walk from town to the university campus, across the Iowa River, to the monstrously large Kinnick Stadium. John had hooked me up with his friend Jim, who had been the president of the CoL board, who runs a tailgate party from the back of his Suburban – serving up a menu of beer, snacks and a good time! Tailgating is a uniquely American experience and, when stood with a light beer in a koozie in your hand in a freezing cold parking lot with a man playing a Sousaphone next to you and everyone singing their “fight song”, then you understand why. Everyone at Jim’s party was so welcoming and interested in what I was doing, including one who was a school librarian – so we had a great chat – plus, his friend Kim got me a ticket for the game! My over-riding memory for the game was that the stadium, which seats 70,000, was full and this was for a university game! The last time I watched a team in gold and black on a synthetic pitch was Basford United, and here was a crowd the size of Manchester United! It was also freezing! Iowa was experiencing a bit of a cold snap and it got down to around -2! Iowa beat Minnesota by 17 – 10 and they got to keep a trophy of a pig called Floyd. As an outsider, it was a strange experience, especially with the stoppy-starty nature of Gridiron but I did enjoy the noise of the partisan crowd, particularly when it was the opposition’s third down! Before the game at Kinnick Stadium! Go Hawkeyes! After the game I headed back into town to meet Rachel and her husband to see “the other side of Iowa City”. IC can seem quite genteel and a sleepy university town that can spill over a little when the football or the students are on form, but there’s a subversive side too. Rachel wanted to show me this and we went to the Heartland Bombshells’ queer Halloween-themed burlesque show at the Blue Moose tavern and grabbed a few beers in some of the other bars, although sadly Vonnegut’s old haunt of the Dublin Underground was full of students in fancy dress. On my final day in Iowa, I found out that James T Kirk was "born" in Riverside, Iowa on March 22, 2233, so, to all my new found friends in Iowa, may you all live long and prosper, and yes, in this analogy I'm so definitely Spock. Now my Midwest adventure continues south to St Louis, MO and Alton, IL before heading across to Tennessee! This is still feeling like one incredible journey! 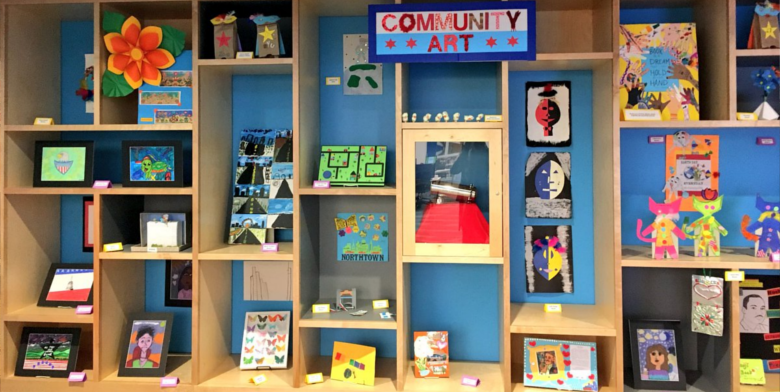 Children's art work at the Harold Washington Library, Chicago. I’m now in Iowa, home of corn and the Hawkeyes, after another speed-through in Chicago. I had a fantastic few days in Illinois with my super host family, the Careys, the parents of a friend of mine and Cáit’s. Mag and Gerd were super, and I got tasty dinners every evening, including steak on the BBQ! Their house, in the suburb of Park Ridge, was very close to the commuter train station into the city. After arriving in on my Amtrak on Tuesday morning, I went directly to the Careys’ and had a shower. Mag made me a delicious breakfast and then, wash and fed, I headed into Chicago again. Once at Ogilvie Station, the hub for the commuter trains, it was straight to the L trains to cover the short distance to the Anish Kapoor “bean” sculpture. Whilst I could have easily walked, Chicago’s L trains are mostly elevated at 2nd storey level and are a great way to see the city’s beautiful architecture quickly and to nose on people in their 2nd floor offices! The bean was always going to be on my “to do” list with Kapoor’s Sky Mirror being outside Nottingham Playhouse so to see a sister sculpture in the US was always something I wanted to do. Whilst the weather was pretty lousy that day, I liked the effect that the rain had running down the chrome-shape and, still in the drizzle, I wandered down through Millennium Park checking out all the other public art and sculpture. Over the road from the park is the city campus of Roosevelt University, who I’d tried to make contact with a few times, but never very successfully. I decided to pop in and see what was happening and the nice people at the desk allowed me onto one of their under-graduate tours, which meant I got to see their beautiful panelled library and go up to the 31st floor at the top of the building for the view out onto the lake, Soldier Field and the Navy Pier. I also chatted with their international office, who hopefully will be able to be point of contact for future scholars. Over the road from RU is the Harold Washington Public Library and their newly renovated children’s library, which I was shown round by Karina, one of their amazing librarians. This was probably the best children’s library I’ve seen. Their desk was at the right height for children to see over and use, there was an arts and crafts maker space, their shelves were low – allowing children to reach and access ALL the books, there were loads of play areas with foam building blocks, puzzles and dressing up costumes AND the low shelves had crawl through spaces for children too – in the shape of the bean! I had such a great time with them, hearing about how the space was designed and changed from how it used to look to be much more ergonomic for children’s use but also chatting politics, travels in Europe and books! The library stays open until 9 and I lost track of time, so was late back for dinner – not the best move for a house guest. On Wednesday, I was working with two amazing organisations that were right up my street. In the morning, I went into George Washington Carver (the man who invented peanut butter) Elementary School in South Chicago with the amazing Stay Sit Read. SSR is an incredible organisation that works with schools in deprived neighbourhoods to get children reading though reading books aloud together and in a fun playful way, whilst also using this technique to create story prompts for the children to write their own tales! They also bring dogs into school and allow the children to interact with and read to the dogs. The whole curriculum is canine themed and gives the children access to books, reading, being read to and positive settings around dogs, which all may be things not happening at home. I was on a table with 5 2nd graders and we read Biscuit Goes to School together – I was quickly adopted by the quiet but trying Floyd, who on a table of boisterous kids was struggling to read the book and concentrate on forming the words. We ended up reading the book line by line to each other and making loud woofing noises every time we turned the page. Floyd struggled to get motivated in the story activity, but then it was his turn to hang out with Maggie the dog. When he came back to the table, he was transformed and together we wrote a short-story about him bringing a dog to school and he drew a great little picture. I think Floyd and that interaction will be hard to top as a highlight of the trip. Kate, SSR’s program leader, dropped me back in Chicago in the funky neighbourhood of Wicker Park, where I grabbed a coffee and browsed the used bookstores, before my meeting with 826 Chicago and their Secret Agent Supply Store. I met with Tyler, their store manager, and spent an hour picking his brains for tips on how to run the storefront element of an 826 space. He has certainly been the most retail focussed of the 826 staffers I’ve met and, with around 20% of 826CHI’s funding coming via the retail space, it is paying off – Chicago, Tyler tells me, is the 826 with the highest proportion of their funding coming directly from the store. I also got to see some of their after-school program in action and saw loads of kids benefitting from the 826 tuition. On my way back into town I popped into Podhalanka, the Polish diner. Chicago is the second largest Polish conurbation in the world behind Warsaw, so I couldn’t miss out on some pierogi and kielbasa! Tyler also put me onto another organisation, Open Books, who sell second-hand books to raise money for children’s literacy programs and it was conveniently close to Ogilvie, so I nipped in before my train back to Park Ridge and got Cáit a book! Another sleep and another hearty Carey breakfast, then it was back to Chicago on the commuter train and my Windstar bus to Iowa City. Having a great time in Iowa City so far and will write up my time here when I’m on the bus to St Louis tomorrow! Blog twenty-five: my little piece of D.C.
Sunset over the Jefferson Monument, D.C. So I’m in Cumberland, MD – on my way to Chicago on the over-night AmTrak. I’ve had a whirlwind few days in DC and my first few days of flying solo now Cáit has gone back to Notts. It’s been strange not having her here as we are, as a couple, whilst fiercely individualistic and independent, very close and sometime live very much in each other’s pockets. I think when we were in New York I was a bit preoccupied with work and the enormity of the trip and should have spent more time enjoying the short time we had put aside to try and be together whilst I’m here but I’m much better at these things in theory than ever in practice, however our last full day in NYC was super special when I tried to disengage scholar-brain more. In my last blog I left off on my bus from NYC to DC and now I’m on my next transport leg. When I arrived in DC I headed straight to the apartment of Cáit’s family friend Mary, who lives just over the Potomac in Arlington, VA. After quickly settling in I caught the Metro a few stops to Arlington Cemetery to pay my respects to the men of the 82nd Airborne’s 508 Parachute Infantry Regiment who, in 1943-44 were stationed at Wollaton Hall in Nottingham, before their dropping into occupied France as part of the D-Day landings. It was very special and incredibly moving to be at such a venerated place in the national psyche as Arlington and to make a connection that had impacted so many people across the world, but also in microcosm so many ordinary Americans transplanted to West Nottingham and the people they met there. The 508th got on like a house on fire with the locals, according to the sources I’ve read, and were especially popular with the women working at Players. The 508th memorial, a plaque and some fir trees, is in the shadow of the Tombs of the Unknowns, which are under 24-hour ceremonial guard – carried out by the 3rd Infantry Regiment, the Old Guard. I watched their step-perfect changing of the guard with all its pomp and solemnity as the sun started to set. D.C. FDR memorial in the Tidal Basin. On Saturday, after a free coffee at Commonwealth Joe in Mary’s neighbourhood who were celebrating their birthday, I spent much of the day criss-crossing up the Mall from the Capitol, to the courts, to the White House, to the Washington monument, Lincoln memorial and war memorials. I had a stop off in the Smithsonian Museum of History – getting a glimpse of Lincoln’s top hat, a tree stump scarred by musket balls and cannon at the Bloody Angle, the original flag which inspired the Star-Spangled Banner after the War of 1812, one of the original copies of the Brown decision, Muhammad Ali’s boxing gloves and Indiana Jones’ hat and whip. It was an amazing array of America and its cultural artefacts and culture. I was disappointed by the First Ladies’ gallery which reduced much of their contributions to frocks and crockery. I’d hope Eleanor’s response would have been a stern letter to the curators on UN headed note paper. 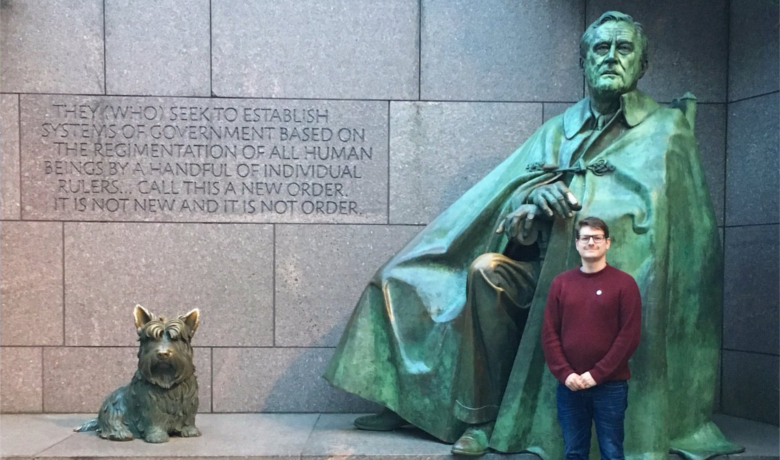 I also completed my FDR memorials tour with the Archives Stone (the monument he requested on a scrap of grass outside the archives building which is a block of white stone no larger than a desk and is markedly similar to the grave stone in the Springwood garden) plus the larger traverse-through memorial in the tidal basin, which fittingly includes tributes to Eleanor, his policies in the New Deal and, popularly based on where folks were queuing up for photos, Fala the dog! In the evening Mary and I had dinner at her apartment and then watched the end of the Patriots-Falcons game. Today (Monday), was another hot day (the weather has been scorching whilst I’ve been here, but I’m looking forward to jumpers weather and 12 degrees in Chicago!) but humid and I had my big bag today ahead of my train. Even so, I went to the Library of Congress (closed Sundays) and saw the small sections open to the public, including the famous reading room from the viewing gallery. I didn’t have time to hang around for the tour, which I believe would have taken me into the library and its halls of books, as I had to get off to my next appointment, but I did see a Guttenberg bible, which was pretty cool. Brandon likes his hat, 826 DC. After the LoC, I headed to 826 DC and their store-front Tivoli’s Astounding Magic Supply Co. I was met by their store manager Caroline and we had a great chat about how the store runs, the items that sell really well and how kooky you can be with things. She had some really great advice on having a strong clear concept for the store and being as upfront as you can be with people about “what the store is” whilst keeping the wonderful elements that make it so, well, magical! Areesha, their Development Director, then took me for coffee and we talked business plans, funding structures and evidencing and impact recording – all things I need to think about much more than my wibbly-wobbly “wouldn’t it be nice if…” kinda way! Then I spoke with Brandon, who has just moved to DC to work at 826 from Iowa City so got some literary links and food recommendations from him, which was really cool, plus he got super excited by the Robin Hood hat. From there it was to Union Station and my travelling bed seat for the night. The AmTrak is kind of amazing – there’s a “viewing car” with wiggly seats and chargers so I sat, with my new friend Jesse, and watched the sun go down over Maryland and West Virginia. The coffee’s pretty good on-board and big pack of crisps will see me through for snacking. Next stop: Chicago tomorrow morning! Post-Script: having spoken to people in the US, especially Tina who we stayed with in Brooklyn, Houston is looking like I shouldn’t visit as the area is still reeling from the hurricane which ripped through the city. Also, for route planning this has made a few decisions for me and I’ve resolved to get from Memphis to Albuquerque using the route: Memphis – Dallas – Oklahoma City – Albuquerque, which whist long will get me into some bits of the States I’d love to see and experience plus, put me into contact with some new and exciting literacy organisations. Arkansas, Texas and Oklahoma won’t know what hit it! This blog is a space for me to think about my trip, my home town and the USA. It's about the legacy of FDR, the role education can play in young peoples lives and anything else that takes my fancy. These are all my opinions, including and especially the posts from my Twitter feed, and may not reflect those of the Nottingham Roosevelt Memorial Travelling Scholarship.